Black Clover has really been hitting its stride one year into the anime. After an awkward first few arcs, the exploration of the wild and crazy ensemble cast of the Black Bulls, some stand out fights, and now we’re headed into a tense emotional arc. 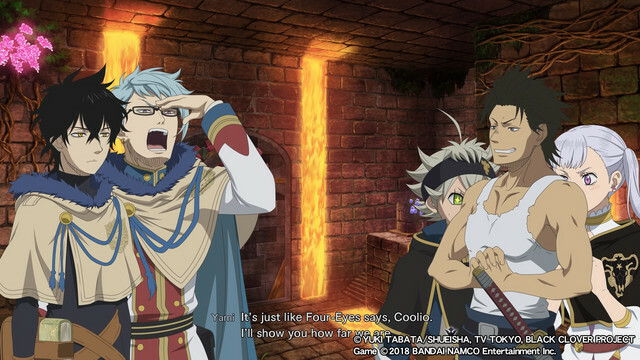 Just as we’re beginning to see the strengths that landed the title in Shonen Jump, Black Clover has reached another threshold that many of the top shonen are fated to cross: A video game. 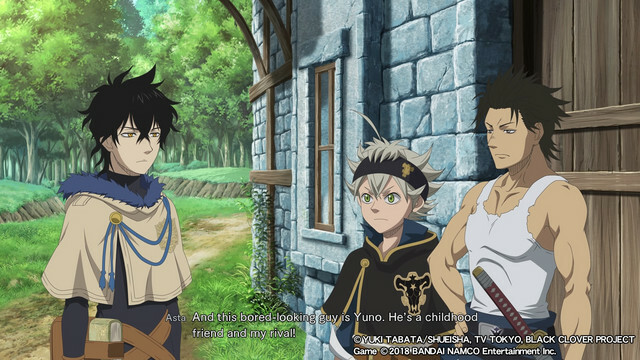 The past few months have been a constant drip feed of character announcements for Black Clover: Quartet Knights characters, with their previews showing many indications of a team-based strategy game, showing off special abilities that could heal allies, zone control, provide mobility or buffs, and crowd control enemies. The result is something like a magical, 3rd person Overwatch, even featuring hallmark FPS modes like payload and king of the hill. While the inspiration for Quartet Knights are pretty clear, it definitely has it own personality. 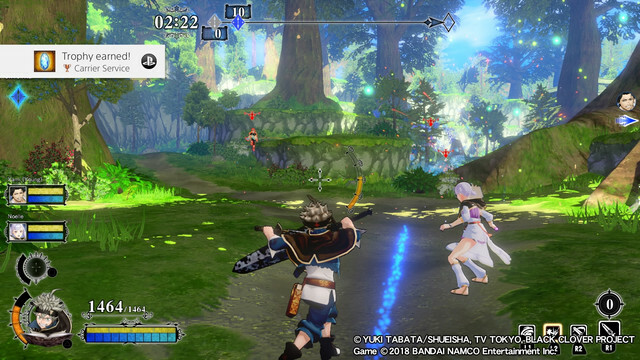 The gameplay format requires teams to stand in certain zones to push a giant crystal or gain control points matched with a cast of primarily ranged characters with large area of effect abilities makes for a pretty fun dynamic. The defending team typically needs to have at least one character out in the open so keeping control is fundamentally more difficult than attacking. I realized I’m describing the basic premise of these sorts of games, but 3rd person perspective and larger AOE make the defending disadvantage feel much more pronounced. An abundance of ranged zone control also lead to a lot of bottlenecking enemies to deliver strong skillshot or area of effect damage they can’t avoid. Levels also include artifacts like healing herbs, speed rings, and magic bombs which have pretty obvious uses, as well as a majority artifact that can be captured to give your entire team a huge damage boost but is located on a platform well away from the objective, requiring the defending team to split their attention or allow the attacking team to gain an advantage. There are definitely some missed opportunities. Link attacks may be the biggest, allowing you to take advantage of an opening created by your teammate’s hitting the enemy. An indicator appears on your screen with an R1 button prompt, but the attack itself is the same animation as your normal R1 with some stylized HUD graphics and a guaranteed hit at higher damage value. This feels particularly strange with melee characters like Asta since he can be nowhere near the enemy. Melee characters have very intense rushdown, so maybe trading out their speed with targeted dashes on links might promote more coordination? As is, the interaction often feels confusing, especially on the receiving end. The bare bones design and large cast lead to some predictable issues. Certain characters are just more powerful than others. Providing hard crowd control, utility, or a large area of effect ultimate are pretty easy predictors of how strong a character is, with a few even possessing all these things. Games can easily descend into chaos with so many characters spamming spells with large particles. Combined with the minimal game design, it can be difficult to parse what’s going on. Beyond that, the outcome of many matches feels random, with the raw simplicity of the title not lending itself to strategic or mechanical outplays. The above complaints are unfortunately familiar to me, since they’re the same I’ve come away from my hands-on with another upcoming team-based 3rd person Shonen Jump port, Naruto to Boruto: Shinobi Striker. Neither seems to be committing to competitive or casual play and therefore don’t feel particularly suited to either type of player. 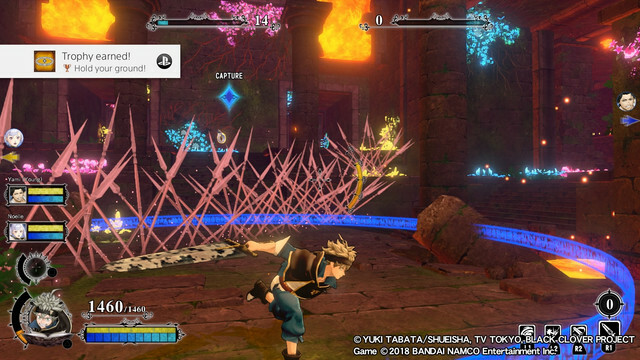 Despite the online mode appearing to be the central focus of the game, it does feature a surprisingly developed, if somewhat short, story mode featuring a movie-like one-off scenario with an original enemy penned by Yuki Tabata himself. Seeing his involvement in the credits was no surprise since the character interactions in the story felt genuine to the anime. The narrative smartly focuses on fan-favorite Yami and some pretty absurd time-travel shenanigans involving Yami’s backstory and an original villain. Without giving away some of the twists, I feel confident writing that Tabata may have been inspired by playing through NeiR: Automata based on the story structure. The story was surprisingly satisfying all things considered, even including on original soundtrack and some new animation. My one real beef was that 100% of the main missions had you playing the melee fighters Asta or Yami despite the game looking for every excuse to pull in more of the extended cast. By the end you’ve teamed up with or fought just about every character introduced in the anime, but only play two of them. This in no way prepares you for online mode since the majority of the characters are ranged and you play exactly none of them in the first story pass. Challenge mode seems like it was intended to bandaid this issue by basically allowing you to try out each character while earning some extra in-game currency but it’s basically always the same and there are no stakes, so incorporating character swaps into the story would have been a more fun way to introduce them. Finally, there is an in-game store that lets you purchase new chromas, quotes, and cards for each character. I definitely didn’t feel like the game was trying to fleece me since the average price of any of these things is about 1,000… whatever the in-game currency is called and missions usually pay out 3,000. The card-based customization doesn’t feel like it significantly affects play and the chromas are nice, but I’m personally hoping they release some alternate outfits for more characters down the line, especalliy besides those swimsuits. Black Asta and Golden Dawn Yuno are the only alternate outfits avaliable in the base game. As someone who watches Black Clover week-to-week. I felt like what I got was a pretty fun mini-arc in the story mode. Outside of that, Quartet Knights had some fun ideas, but I’m confused just what niche it’s trying to fill. Much like Shinobi Striker, I can’t really see a scene developing around the title and online-only multiplayer doesn’t make for a good game to play with friends. The prospect of more truly competitive shonen ports like Dragon Ball FighterZ or awesome party games like Naruto: Clash of the Ninja are both compelling, but Quartet Knights doesn’t feel like it could become either. I enjoyed my time with it but, after the story and a few online matches, I can’t really think of a compelling reason to boot it up again.